This Itinerant Seminar is a three week walking seminar for artists and individual coming from related disciplines who are interested in the changing relationship of humans to land; geography and built environment; and post-industrial and post-military devastation. During the walk we will also be paying attention to human relations to other species, forms of labor and social organization, informal economies and gender, among other subjects. We expect participants’ interests to affect the scope of the seminar. The seminar is organized by artists Beatriz Santiago Muñoz and Ramiro Chaves. We are particularly interested in the ways in which abstract political and social concepts become materially and sensorially manifest. Most of the time we will be traveling on foot and sleeping outdoors: direct observation and interaction at a human scale is an essential method for understanding these processes. We will meet in San Juan, spend a couple of days preparing in Beta-Local and set out walking from Guayanilla through the southwestern coast of Puerto Rico and end 2 weeks later in Cabo Rojo, where we will stay for 3-4 days. We will be going walking through bat caves and post-industrial developments, open road, dry forest and beach. Though working collectively is not necessary, the structure and method of the seminar demands communal work and solidarity, as we will be undertaking a collective adventure: cooking together, sleeping outdoors and inevitably running into problems. A willingness to embrace the unexpected and improvise on your feet is essential. 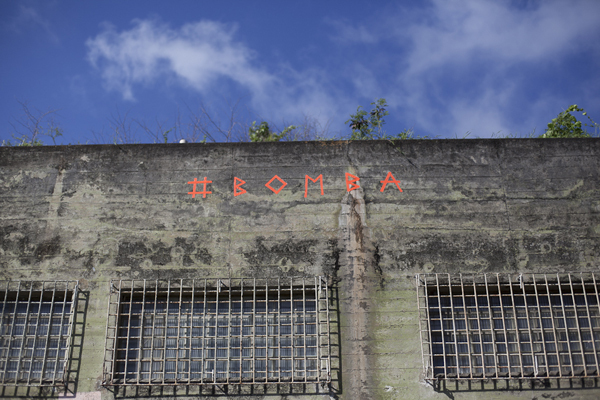 The seminar is anchored in the specific geography, local knowledge, emerging art practices, and social and political conditions of Puerto Rico. The island’s exuberant tropical ecology coexists with environmental devastation, economic crisis, institutional mimesis and decay, militarized and post-military spaces, as well as a growing movement to understand and transform these conditions. Language: Bring your best spanish-language skills to the table! Some of us may speak english, but others may not. We will try to meet you half-way. Life is not in english only and language is not the only means of communication. Housing and food: We will be sleeping outdoors most of the time, except for the last 3 or 4 days of the seminar. Everyone must have hammocks or tents (preferably hammocks). We will cook collectively. You should budget another $250 for food. Fee: The seminar has a fee of $500 and a 10 person limit. An abbreviated portfolio with a selection of 1-3 works, a short statement regarding your interests and their relationship to this seminar. Please send everything in one pdf, with links to web for any video or other documents. El seminario tiene un cupo límite de 10 personas. Fechas: el seminario es desde el 29 de junio hasta el 20 de julio. Lenguaje: Traiga sus mejores destrezas bilingues a la mesa. Algunos participantes hablarán español, otros no. Tendremos que encontrar un punto de balance constantemente, pero el lenguaje no es el único medio de comunicación. Techo y comida: Estaremos durmiendo afuera la mayoría del tiempo. Debes tener una hamaca o tienda de campaña (preferiblemente hamaca). presupuestar otros $250 para la comida. Cuota: El seminario tiene una cuota de $500, que se puede reducir por una razón de peso. Criterios de selección: un portafolio abreviado con una selección de 1-3 obras, una breve nota sobre tus intereses y la relación a los temas del seminario. Envíalo todo en un pdf, con enlaces externos de vídeo o cualquier otro medio integrado en el mismo documento. Envía los documentos a info.betalocal@gmail.com en o antes del martes 29 de abril con SUMMER SESSION 2014 en el título.